The Guadalupe Valley Electric Cooperative (GVEC) is a progressive and responsive partner equipped for businesses, small and large. We serve one of the largest clusters of commercial and industrial customers in the region and we have the values, work ethic and experience to exceed our members’ needs. That’s just one of the unique aspects of doing business with GVEC. This high standard is met through consistent monitoring and maintenance of our electric system. Annual maintenance includes inspecting and changing out thousands of poles, upgrading wire and equipment, establishing new lines, and investing in transmission lines when necessary. With distribution as our primary service, GVEC operations are robust enough to also build and maintain our own transmission lines; a quality of which only a handful of cooperatives can claim. Contact Economic Development staff at commercialaccounts@gvec.org or 830.857.1207 to confirm information. 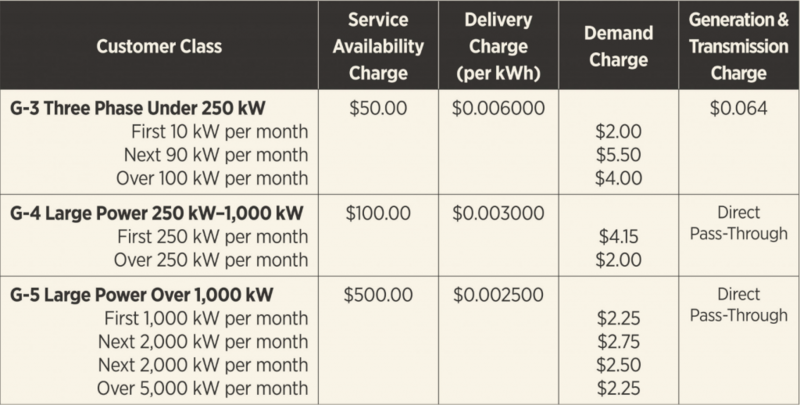 Demand Charge – G3, G4, and G5 accounts incur a monthly Demand Charge based on the maximum killowatts metered during any 15 minute interval within a billing cycle. For further details, contact the Economic Development staff at commercialaccounts@gvec.org or 830.857.1207.